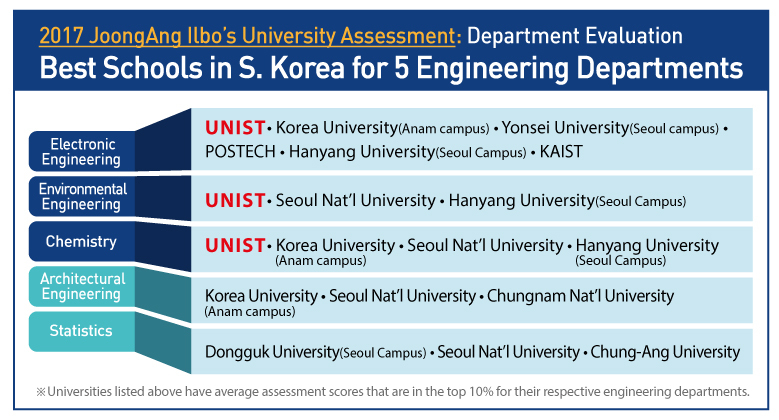 UNIST Electrical Engineering ranked top-level at JoongAng Ilbo’s University Assessment 2017. Each year, JoongAng Ilbo conducts an assessment of Korean universities based on a total of 32 evaluation indices, including globalization, faculty research, educational environment, finances, reputation, and performance of graduates in society. 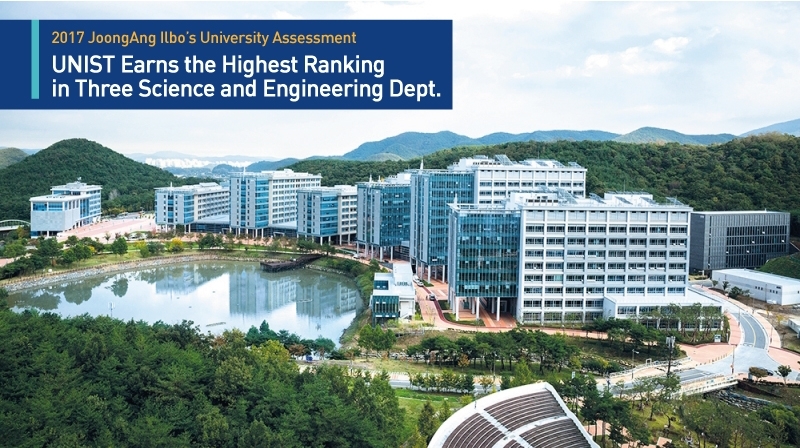 The assessment, which was conducted in celebration of the 54th anniversary of JungAng Ilbo, focuses on the evaluation of the four-year-course science and engineering programs in South Korea, which includes Electronic Engineering, Environmental Engineering, Chemistry, Architectural engineering, and Statistics. In its announcement, JoongAng Ilbo noted, “UNIST has a short history, yet it has been consistently achieving outstanding scientific results and education.” The rating was based on 10 percentage-based performance indicators, which include six indicators that assess research impact, based on research citations per paper, h-index in the relevant subject, as well as research expenses. The other four indicators were used to assess institutional’ reputation in each science and engineering subject based on the number of students per professor, scholarship ratio as compared to tuition, and employment rates. Based on such evaluation, the top 10% are classified as “Highest-rated”, 25% as “Best-rated”, and 50% as “Good”. Out of 71 universities that have been assessed, 61 have the department of Electrical Engineering. Among them only six universities, including UNIST, KAIST, POSTECH, Yonsei University, Korea University and Hanyang University, were evaluated as the top ranking. Since ICT technology in Korea is highly developed around the world, competition among universities has been more serious in the fields of electronics, such as semiconductor, display, wireless communications, and artificial intelligence. In this context, it is particularly noticeable that UNIST’s Electrical Engineering track ranked at the highest level. At UNIST’s Electrical engineering track, currently 22 professors are involved in research and education. In order to lead the fourth industrial revolution in the future, creative and talented people who can create new values by flexibly combining technologies in various fields are the most important. To cultivate such people of talent, UNIST’s Electrical Engineering offers a variety of educational opportunities, ranging from theoretical research to experimental and system implementation, and focuses on fostering creative and innovative potential of young people through the fusion of hardware and software. AI & Robotics Engineer for D..
UNIST Professor Honored as ACM Di..